Chicken Broth Risotto with Peas and Asparagus - GetCooking! 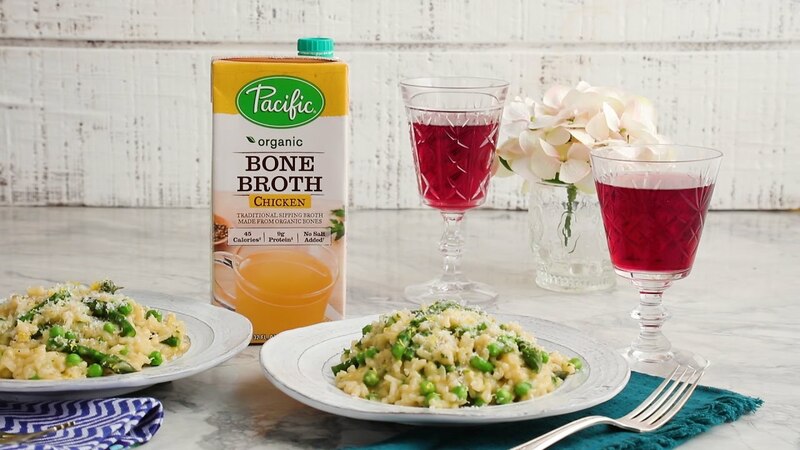 Thrive Market’s – Chicken Broth Risotto with Peas and Asparagus recipe. Risotto is the perfect canvas for celebrating spring vegetables. Although it requires a bit of attention (constantly stirring the rice helps release starch so each grain becomes plump and creamy), the end result is worth the effort! Asparagus, peas, and a generous sprinkling of Parmesan cheese swirl with flavorful chicken broth for a comforting meal—perfect for an elegant mid-week supper or Saturday night dinner party. We’d love to hear your feedback on this video recipe format in the comments section below! If you used this video to make Chicken Broth Risotto with Peas and Asparagus, please tell us how it went! What we love about Thrive Market! Thrive Market is a revolutionary online marketplace on a mission to make healthy living easy and affordable​ for everyone. You can shop for thousands of the best-selling non-GMO foods and natural products, prices are already up to 50% off. Now they’re giving you an EXTRA 25% off your first order + free 30 day trial! View the original recipe notes here: Thrive Market’s – Chicken Broth Risotto with Peas and Asparagus.